BERKELEY, CA: The Haas Institute at UC Berkeley on Wednesday released a resource pack that compiles hundreds of scholarly works on Islamophobia in the US. Titled “Islamophobia in the United States: A Reading Resource Pack,” this publication and web resource provides a comprehensive literature review, grouped by 10 themes, on current academic research on Islamophobia in the US in the form of peer-reviewed academic journal articles and books. This work adds to a body of research from the Haas Institute documenting the rise of Islamophobia. Seventeen years after 9/11, scholars across the globe have researched and documented the impacts of the attacks on the increased racialization and demonization of Muslims in the US. This rise in anti-Muslim sentiment has been commonly referred to as Islamophobia among researchers, policymakers, and community activists. What is emphasized by many of the works cited in the reading resource pack is that Islamophobia is not new. Rather, the authors note that Islamophobia in the US is part of a deep-rooted demonization of Islam and Muslims that pre-dates the tragic attacks. But following 9/11, there was a rapid increase in the volume of publications that broadened the scope of research on Islamophobia, to capture the multiple dimensions and impacts of the rising phenomenon in the United States. As a part of the Haas Institute’s larger body of work that exposes, debates, and challenges Islamophobia, this reading resource pack brings to the forefront academic publications that document, critique, provide counter-narratives, and suggest alternative strategies to prevail over Islamophobia in the United States and beyond. In an effort to enhance the utility of existing research on Islamophobia in the United States, this resource pack provides a wide range of stakeholders interested in challenging rising anti-Muslim sentiment with access to a comprehensive reading list, and annotations of key works. This publication is intended to advance the anti-Islamophobia efforts of activists, civil rights organizations, community workers, counselors, students, researchers, and policymakers. 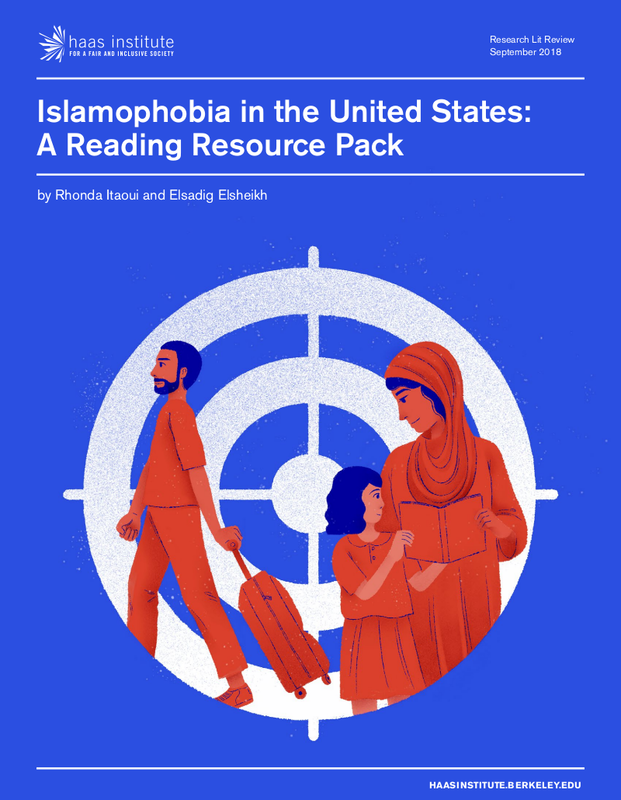 The reading resource pack catalogs more than 430 citations on the study of Islamophobia in the US, organized under 10 main themes: Theorizing the Field; Politics and Foreign Policy; Legal System and National Security; Mainstream and Digital Media; Othering, Discrimination, and Hate Crimes; Gendered Dimensions; Health and Community Well-being; Geography and the Public Space; Counter-Narratives and Strategies; and Young American Muslims and Belonging. These wide range of research themes highlight the multifaceted impacts of Islamophobia on Muslims in various spheres, ranging from political, legal, digital and everyday spaces, across various groups in the US. The Haas Institute for a Fair and Inclusive Society at UC Berkeley is a research institute bringing together scholars, community stakeholders, policymakers, and communicators to identify and challenge the barriers to an inclusive, just, and sustainable society in order to create transformative change.